Did you grow up visiting an Italian bakery? 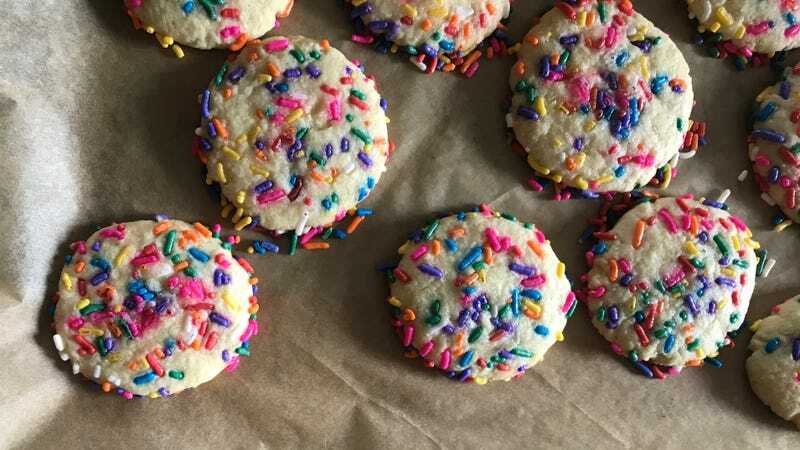 Do you remember these sprinkle-covered cookies? Okay, me too. A craving for these crumbly, sugary cookies struck me over the weekend, and I baked up a batch per this Smitten Kitchen recipe. They weren’t as dry as I remembered, which objectively made them better cookies but somehow threw me as I was aiming for the precise, nostalgic flavor of the cookies I’d remembered. Perhaps I’ll give the Saveur version a go next, unless someone has another suggestion? They were undeniable tasty—no sprinkle cookies remain in the Tupperware—if not exactly complex. They taste like confetti looks: sweet. Come on, just try not to smile looking at these.